honda PCX 125 is a great scooter at a great Price point . Piaggio Fly 150 and lovin it. Ouch! Even expecting you won't pay duty next year, that's quite a bite for the CTP. Over here CTP for a Fly 150 is just $134 (plus GST). Yes Great Price = Value for Money! Well I have gotten about 120kms on the speedo now. I think I have used about half the tank. A really nice easy ride. I think I a nice open road, this PCX will be a great mini tourer. But around the city for those that need and enjoy getting thru the traffic easy & zippy will make it really easy to do. I feel this is going to be a great loyal bike that I will be riding well for a long time. I am going to be heading for a ride around the coast in the morning, and will maybe start a reveiw thread to keep you up to date. and before some of you jump back on a whine that you could get a scooter for half that that will do the same things. The Honda PCX will be like all the other Honda bikes I know friends own. Still doing the same job in 5, 10, 20 years time. good review. Your scoot will still be doing the same when the cheaper ones have had engine rebuilds then gone to the great twisty road in the sky. You also have a good dealership to back you up for servicing & parts, although you can take it to any qualified mechanic. I'm SO glad you've found a scoot you're so happy & impressed with. I'm just jealous & want one too. What a fantastic scooter this Honda 125cc is. It is fast becoming the the cult scoot of its class. I'll have to test ride one one day. And compare it to the Italian SH series and the @125 and the Indian Lead. I remember this ad jingle from the 60's and its still in my mind. Talk about the power of advertising. 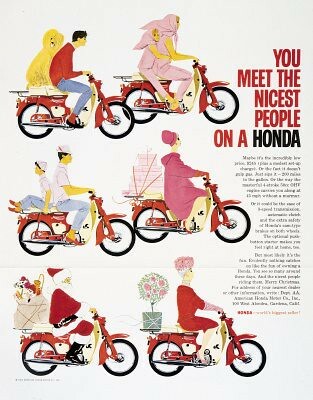 "The best way to get from A to B, hop on a Honda. The only way to go economically. Hop on a Honda and Go"
except we used to sing "Greasers blow"
Thank you to everyone who has shared their experiences of this scooter. It has been very useful. I was wondering if anybody could share how much room there is under the seat? How much stuff can be stored there? I am very interested in this scooter but I reckon I would miss not having a shopping bag hook! But maybe it does have one? Does the non-traditional seating arrangement of this scooter - more like a motorbike - make people feel like they have more on road balance and control and thus feel safer?